The top performer brought $4,750. A total of 60 bulls were sold. The 39th Annual Western Illinois University Performance Bull Sale, held March 18 at the WIU Livestock Center, posted records for both sale average and gross sales. According to Ken Nimrick, associate professor in Western's School of Agriculture, 37 buyers from Illinois, Iowa and Missouri took home "60 rugged, thick-made, high-performance bulls at a record average price of $2,484." "The top 20 bulls averaged $3,460," Nimrick adds. "Repeat buyers accounted for 73% of the buyers, gross dollars and bulls selling, which attests to the success cow men and women are achieving with bulls out of this sale." The top performer brought $4,750. 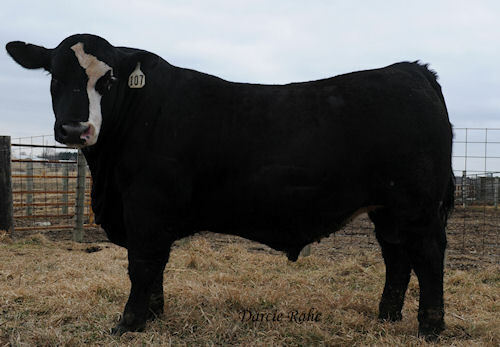 The top-selling bull and "indexing composite, DAF Pin Stripes X38, brought $4,750." He noted that more detailed results are available at www.wiu.edu/bulltest (click on "Sale Results" and/or "Detailed Sale Report"). "Breeders are encouraged to enter their top bull prospects in the next test, as we hope to continue building upon the reputation of the WIU tested bull sale as a source of top quality performance-tested genetics," Nimrick says. "Information on the next test will also be available in June on the test station's website at www.wiu.edu/bulltest." For more information about entering a bull, contact the WIU School of Agriculture at (309) 298-1080.